Inoue Yūichi (1916-1985) was born in Tokyo the son of a bric-a-brac dealer. In 1935 he graduated from Tokyo Prefectural Aoyama Normal School (present-day Tokyo Gakugei University) and almost immediately began working as an elementary school teacher at Yokogawa National School, Tokyo. Although he always aspired to become a painter, Yūichi was lacking the means to attend Art College. He therefore took evening painting classes and later turned to sho (calligraphy) due to its inexpensive materials and less formal instruction. 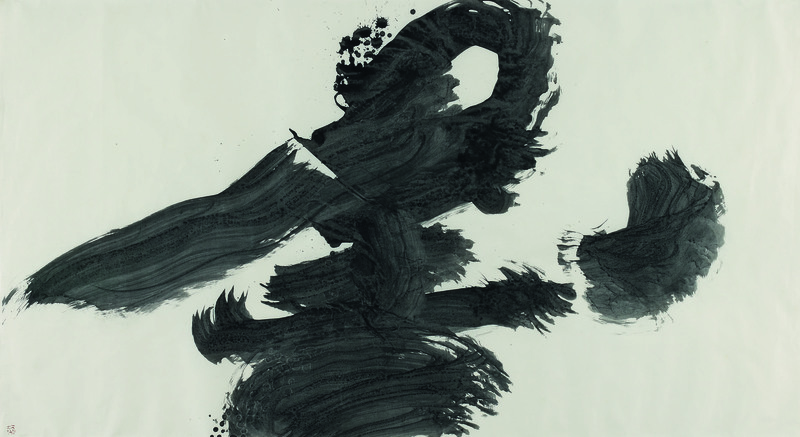 In 1941 Yūichi began to study calligraphy under the renowned modernist calligrapher Ueda Sōkyū (1899-1968) and joined his master’s avant-garde calligraphy group Keiseikai. 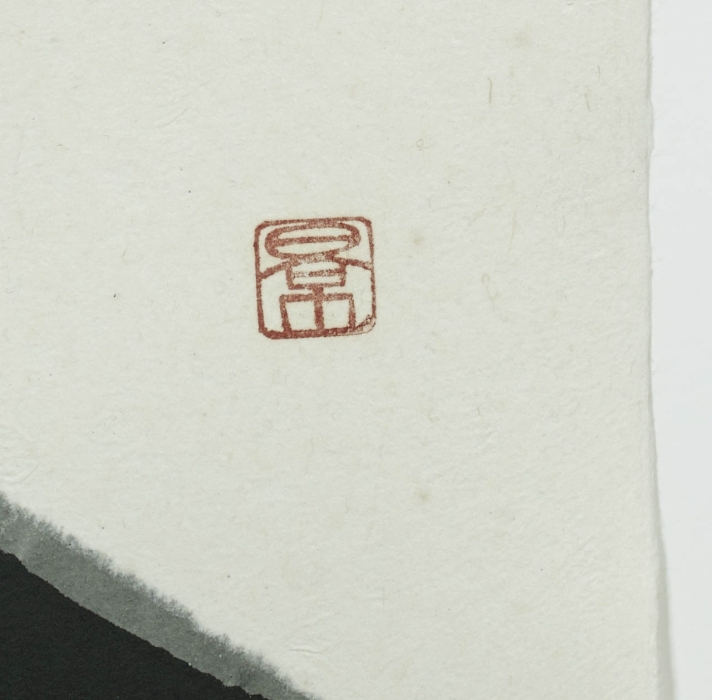 Ueda himself came from a modernist tradition of avant-garde calligraphers advocating the study of kanji (Chinese characters) by old Chinese masters, while at the same time being aware of contemporary international art movements. The emphasis of Ueda Sōkyū and the Keiseikai group was on the emotional expression of the self at the moment of writing. According to Ueda it is more embarrassing for a calligrapher to lack heart than technique. In March 1945 Yūichi was on night duty at the Yokokawa National School where 1,000 people were taking shelter from a bombing raid by the American air force. The school was engulfed by flames and Yūichi was left as the sole survivor. This tragic near-death experience left him deeply scarred and he later described his ordeal in the calligraphic piece entitled Ah! Yokokawa National School, now in the collection of Unac Tokyo Inc.
‘The town plunged into darkness is transformed into an incandescent sea…. All Kōto-ku is hell fire’ he begins. ‘A thousand refugees have no shelter and there is no exit.’ Buried all night in a heap of corpses, Inoue concludes, ‘At dawn, the fire is out. Silence is all. No cries’. The horrors of war led Yūichi to dedicate his existence to the study of avant-garde sho and its promotion through journals such as Shonobi edited by Morita Shiryū, under the leadership of Ueda Sōkyū. He also became fascinated by modern western art and was regularly informed about action painting, abstract expressionism and the work of ground-breaking artists such as Franz Kline (1910-1962), Mark Tobey (1890-1976) and Jackson Pollock (1912-1956) by the pages of the Bokubi journal first published in 1951 by Morita Shiryū. Yūichi also befriended cultural emissaries such as Isamu Noguchi (1904-1988), the international avant-garde artist Hasegawa Saburō (1906-1957) as well as various artists from the Gutai group. In 1952 Yūichi along with four other disciples of Ueda Sōkyū; Morita Shiryū (1912-1999), Eguchi Sōgen (1919-) Sekiya Yoshimichi (b.1920) and Nakamura Bokushi (dates unknown) left Keiseikai to found the avant-garde calligraphy group Bokujinkai. The group’s activities were documented in its journal Bokujin edited by Yūichi until its 50th issue. The group’s goals were to liberate sho from orthodox conventions, to present it within a global perspective and to establish it as a contemporary artistic medium. The main emphasis was on individual study and unrestricted expression and so the group members refused to participate in large exhibitions or organisations in Japan. Yūichi along with the rest of the Bokujinkai calligraphers abandoned traditional sho materials. This experimentation meant substituting the traditional fude (brush) with cardboard, sticks, hemp-palm and broom sized brushes. 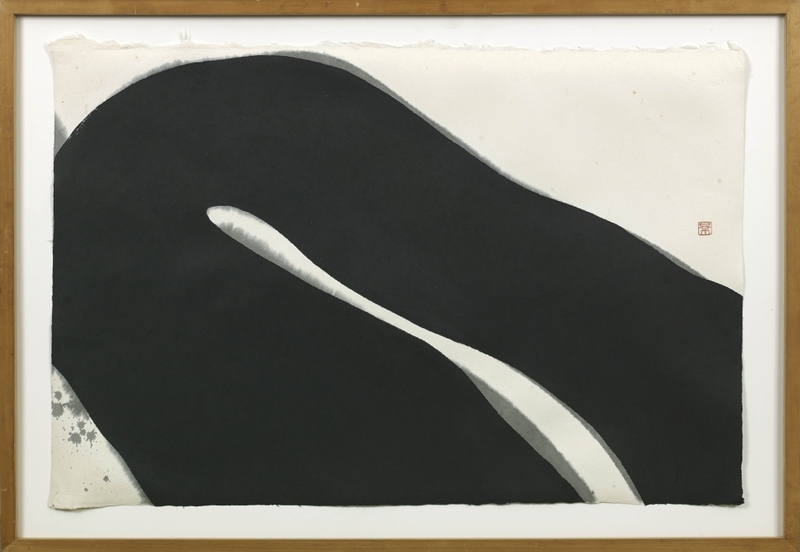 Sumi (ink) was also replaced with mineral pigments, oil paint, enamel and lacquer while canvas, wood, ceramic and even glass were used in place of washi (paper). Although their methods were totally innovative, the group pursued a rigorous re-evaluation of the fundamentals of ancient calligraphy and the timeless qualities of the calligraphic line from a contemporary, universal point of view. 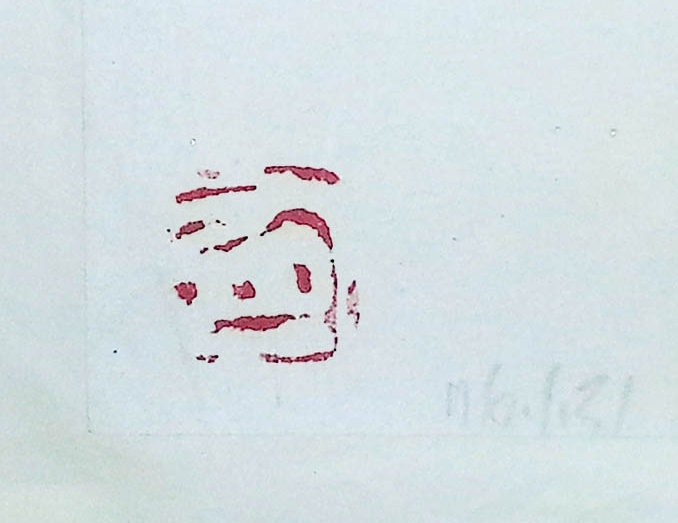 These avant-garde calligraphers were not overly concerned that their renderings of kanji characters were legible or whether they had used a character at all. For the calligrapher the process of producing work is an existential involvement. The form gradually becomes ‘his’ during the writing and re-writing of the drafts when the initial or generally accepted meaning of the character may be forgotten. In Zen terms, the form becomes the calligrapher’s koan (Zen dictum). The execution of a piece demands total absorption, both physical and mental, a complete giving of the self to the writing. Implicit in the piece is the whole experience the calligrapher goes through from initial spark, through confused wrestling with the line and form, to the absolute commitment of execution. However, after losing himself in this exhilarating cosmos of experimentation, of discarding the meaning and forms of kanji, Yuichi finally came to understand how marvellous they really were and from around 1957, free from the tradition of sho he devoted himself to action painting while adhering to the original characters so that he was to some extend restricted. Yuichi came to terms with the beauty in the form of the kanji, admitting worshiping the fatal nobleness of the Chinese characters. Despite avant-garde calligraphy’s superficial resemblance to abstract art the abstract within the calligraphic tradition is fundamentally different. An artist, should he choose, can reject or ignore the history of art. The avant-garde calligrapher however, cannot. He is working within a centuries-old discipline combining two visual languages, sho and abstract expressionism to convey deeply felt inner conflict and anguish. When I write a particular character, I am often asked about the meaning of that character. At that point I usually say something that amounts to what you would find in the dictionary. And yet that is a mere entrance-way and no more. To give an explanation that goes as far as I have worked out with great efforts is impossible. Inoue Yūichi, September 1977, [SHO] by YU-ICHI ’49-’79, edited by Unagami Masaomi, UNAC TOKYO Co. Ltd, 1980. SKU: 7348. Categories: modern/post-war, Paintings.